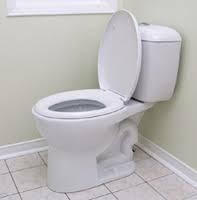 Toilet bowl is one of the most important areas in your bathroom which should be cleaned regularly. Most people think that the bowl itself is the place where all dirt and grime hide, but actually most germs take refuge under and behind the seat. Toilet bowls need careful and regular sanitizing with the proper cleaning products. This is an antibacterial cleaner which is specially formulated for cleaning the dirtiest areas in your toilet. Make sure that you always put a pair of rubber gloves on your hand before starting cleaning. Rubber gloves protect your hands from all dirt, grime and chemicals, so don’t underestimate them. Spay directly on the toilet surface. Don’t forget to put the rubber gloves. Combine in a bowl enough borax and lemon juice to form a paste. Before getting down to cleaning, flush toilet to wet the sides. Use a sponge to apply the paste to the toilet bowl. Make sure that you cover all stained areas. Allow the stubborn stains cleaner to sit for 2 hours. It is perfect time to watch your favourite TV show or to do another cleaning chore. Use the toilet brush to scrub the toilet bowl thoroughly. As stubborn toilet bowl stains can make everyone get crazy, I offer you another great recipe for no-scrub toilet bowl cleaner, which is very effective. Pour all at once into the toilet bowl. Next morning, just flush and all stains should be gone. Making your own toilet bowl cleaners is a great way to clean toilet bowl and save money at the same time. It’s important to know that most commercial cleaners aren’t as efficient as we think they are. I know, that it takes time to prepare a homemade toilet bowl cleaner, but you can be sure that it will eliminate all germ and remove any stubborn stain. If you think that toilet cleaning is not for you, then make sure that you book domestic cleaning services at least two times a month in order to keep your toilet and home germ free. Add your homemade cleaner or share your cleaning experience with us.